Picture yourself on a deserted island, alone and starving. You’re really, really hungry! As you approach the beach, you see a treasure chest floating. You swim out to it and pull it onto the beach. You’re exhausted and weak. You open it, and you’re shocked. It’s food, cold beer, and a radio! But wait. You’re not alone. A large shadow blocks out the sun. Before you can pop open a cold brew, a large, mean, ugly, dirty looking guy is standing behind you with a massive club. It doesn’t look as if you can invite this guy to supper. Who is going to win this fight? This guy looks like the character Tom Hanks plays in the movie Cast Away, only on steroids. Hmm, looks like you better run, swim, or think fast. But wait. Little did we know, that you have been training all your life for a situation like this. Twelve years mixed martial arts and four Black belts in various forms. A true Ninja. Who wins now? Yep, all bets have changed. How does this relate to your subscribers? Here’s the analogy. Some people are gifted and just have an innate ability to learn (like our big guy on the beach has the ability to crush most people, because of his size). Most people aren’t born with this and have to compensate by establishing goals, planning, and working on skills to overcome weaknesses. And those that don’t will have a hard time overcoming the challenges. They won’t get to the treasure chest. They’ll apply what they have used before, even if it really doesn’t work for this. They’ll randomly try different techniques without a plan. Everything becomes essential, and they soon become overwhelmed with info. They see everything new as a massive problem and try to absorb it all together. They won’t see the connections to what they do know. May get a fuzzy understanding of something new but can’t put it into focus. Will practice without making any modifications to problems. Doesn’t recognize the impact of mistakes made. 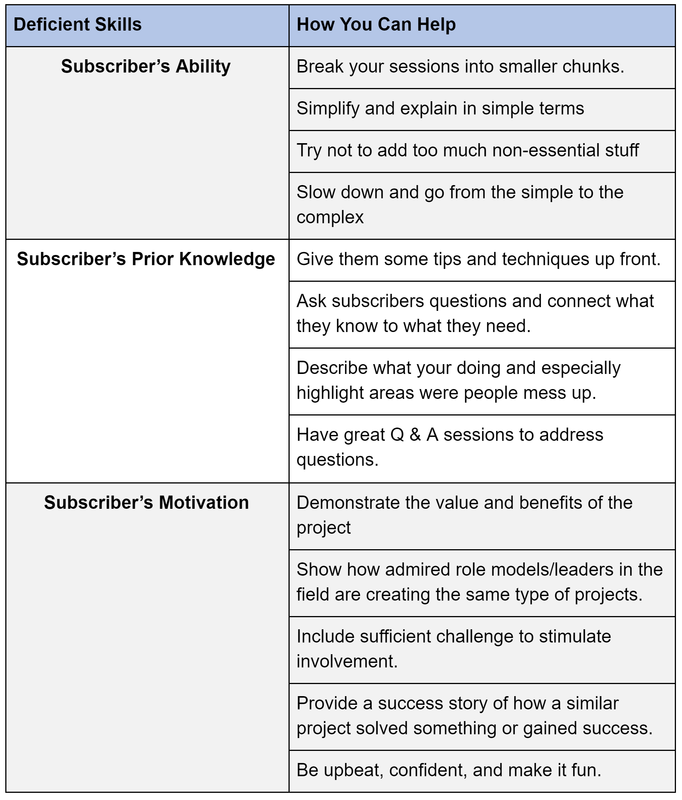 So how can we help your subscribers learn a complex project if they haven’t had the years of training you have? Remember that your instruction is compensation for what your subscribers might lack. That’s it. 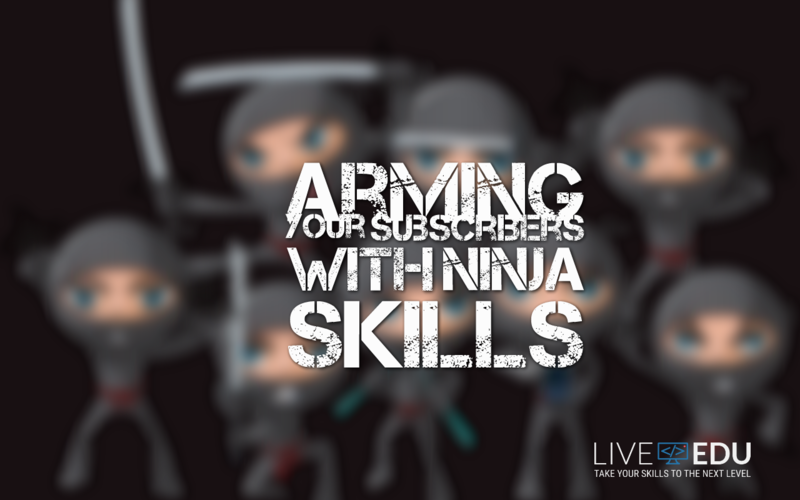 You can arm your subscribers with Ninja-like skills to tackle areas they need help in and become proficient at learning the projects you show.